Why doesn't everyone have one of these? A few months ago our friends over at Giant Loop send us a box of goodies to evaluate on this year's Tour of Idaho. But one item, in particular, has proven so useful in the interim that we feel compelled to opine on it sooner rather than later: the Giant Loop Zigzag Handlebar Bag. 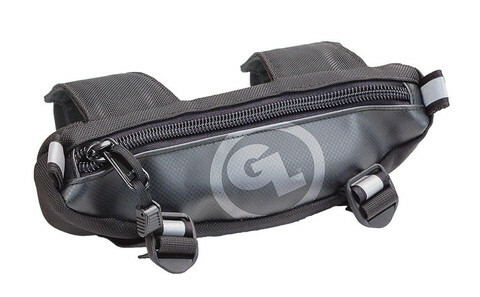 The GL Zigzag, in keeping with the standards at Giant Loop, is the beefiest handlebar bag we've seen. It's approximately 11" x 5" x 3" and has a volume of around 1.5 liters. It has one internal mesh pocket that may be zipped shut. The bag is waterproof and of military spec construction made in the USA. I'm pretty sure that any post-apocalyptic future would include not only cockroaches and radiation, but the GL Zigzag. It's that rugged. Our Zigzag has been dunked, crashed, overstuffed, run over, splashed with gasoline and saw oil, baked in the sun, frozen in spring storms and had the zipper yanked at furiously with gloved hands. The picture above and left was taken just a few minutes ago. As you can see, it shows almost no signs of wear. The Zigzag may be attached to virtually any motorcycle, and the attachment system is adaptable enough that it may also be affixed to backpacks and belts. The Zigzag is incredibly handy for tools, and virtually our entire T1 tool kit fits in it (that's it's T1 application for this year). If that is what you'd use the Zigzag for, it's probably the best handlebar tool bag that you could get. After having attempted to shred our Zigzag for several months now, without success, the only question that we have is why doesn't everyone have one? The Good: Another item of typical GL quality and utility (as in very high). 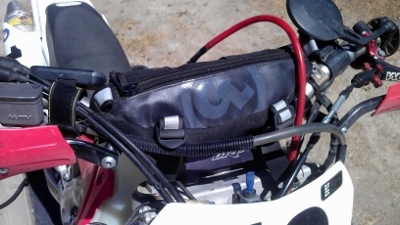 The Rad: Renders most competing handlebar bags obsolete. The Gnarly: Distracts us with images from various dystopian futures while we ride.